At Llanberis, in the sleepy little hamlet of Hollow Tree, the next generation of Halletts is about to move in. But beforehand, there's a little bit of work to be done. Such as rewiring—no easy task when you're dealing with half-metre-thick sandstone walls. The unusual Gothic-style home is being repainted and re-pointed, and a chimney has been taken down, brick by brick, to be reassembled more securely. There have also been remarkable discoveries during the renovation, such as masses of horse hair padding out the walls and original flagstones under the laundry's timber floor. 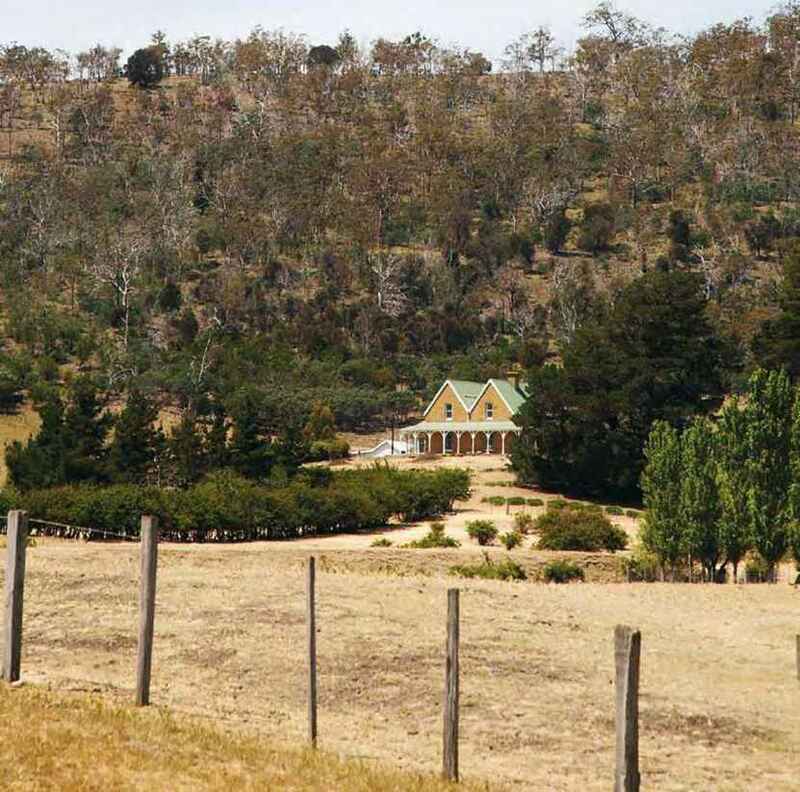 Just down the road at the former Montacute homestead, on a hill commanding serene views of the Clyde Valley, St James is also enjoying something of a resurrection. The Halletts have taken it upon themselves to be caretakers of this little stone church since 1900. 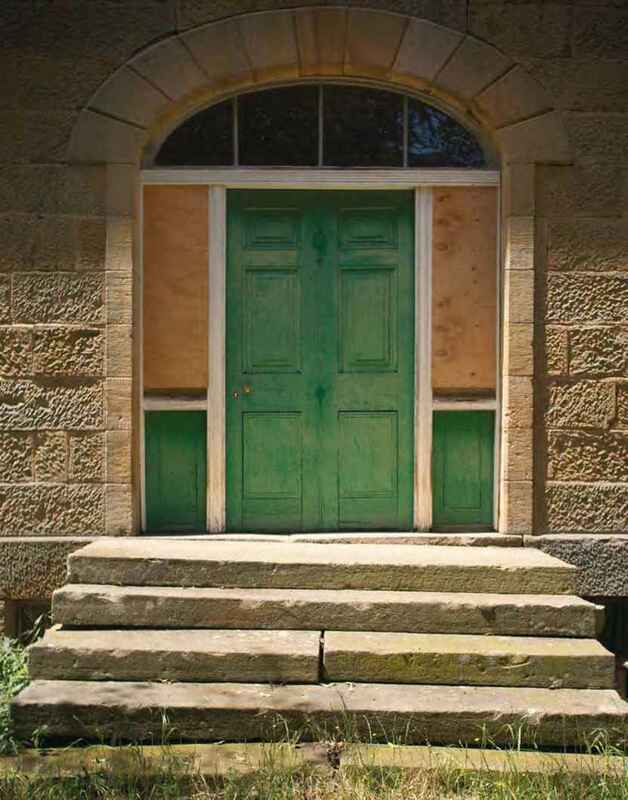 As for Sherwood, the long-since-unoccupied four-storey sandstone mansion is boarded up, waiting for her turn to shine again. Hollow Tree, near the Central Highlands town of Bothwell, largely comprises Llanberis, Montacute and Sherwood, all three owned by the Hallett family. In between managing what seems like a never-ending drought, they are faithful in tending to the wealth of cultural heritage in their paddocks. Although the drought has indeed caused some decline of the landscaped Llanberis gardens, enclosed by a giant cypress hedge. As Richard and Amy Hallett, with their three young children, prepare to move into this old family home, salvaging them is pretty much a case of redesigning the garden landscape with a view to the changing climate. So far as the house is concerned, it's the focus of a busy Block-style blitz involving electricians, stonemasons, painters, plasterers and plumbers, all at work at once. And Llanberis has been kept in good shape, with each generation doing its share of the upkeep. Patterson as his matrimonial home, sited on a low knoll overlooking the Clyde Valley. The two-storey, twin-gabled front and timber verandah on three sides were added in the 1850s or 1860s. 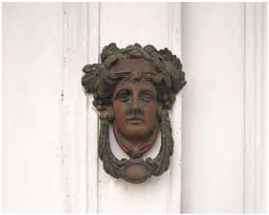 The property underwent a few ownership changes, and a name change, before it was bought by the Halletts in 1914. They had bought neighbouring Montacute about ten years earlier. Montacute had been a thriving pastoral settlement established by Captain William Langdon on land he was granted in 1823. As the operator of trading ships between Hobart and London, Langdon is somewhat dubiously recognised for introducing blackbirds to Tasmania; he also brought out pheasants and partridges. From Napoleon's grave at St Helena reputedly came willow trees that he planted along the River Clyde. And by his door he planted a rose cutting from Montacute House in his home town of Somerset, regarded as one of the United Kingdom's most glorious Elizabethan mansions. Langdon's Van Diemen's Land version of Montacute House was much more modest, although it boasted an expansive slate roof. 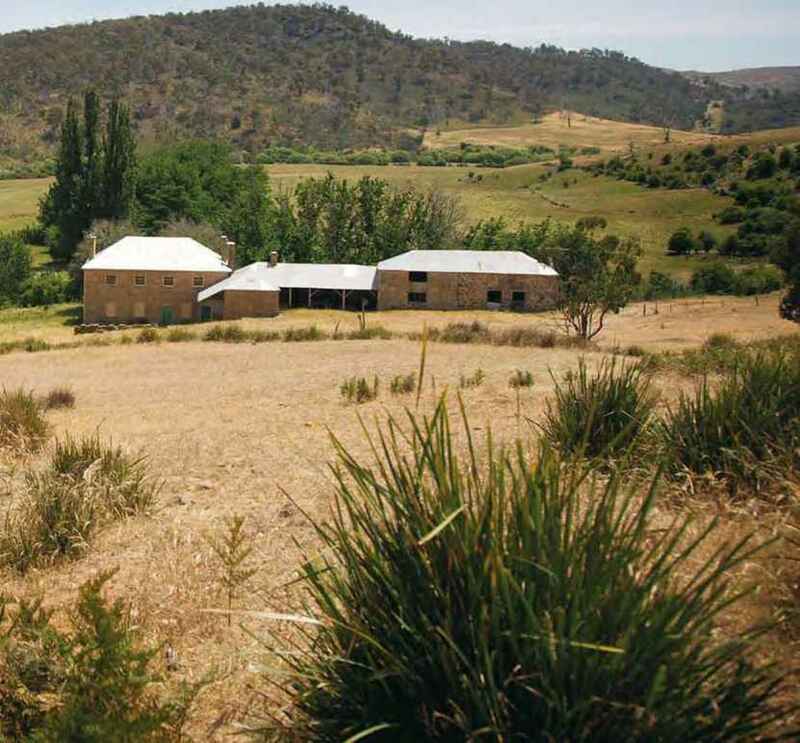 His settlement also included cottages, barns and a garden enclosed by a high brick and stone wall to repel Aborigines and bushrangers. Langdon died in 1879 and the property passed to his son. However Montacute was apparently built of inferior stone and rubble and over the years it declined. Vandals heightened the indignity, taking off with everything from the staircase to the cedar doors, fireplaces and mantelpieces. Today it is a ruin, albeit picturesque. However the Montacute family chapel, which cost Langdon a small fortune to build in the 1850s, is still in use today. Consecrated in 1857, St James is part of the Southern Midlands parish of the Anglican Church and used for services from time to time; Richard and Amy's children, nieces and nephew were all christened there in the last five years. The font was carved from a single piece of sandstone, the original organ is behind the back pew and many Hallett descendants rest in its grounds. The Halletts restored the church in its centenary year, 1957, and have tended to it ever since; part of the cost of the recent roof replacement was met with a small heritage grant. 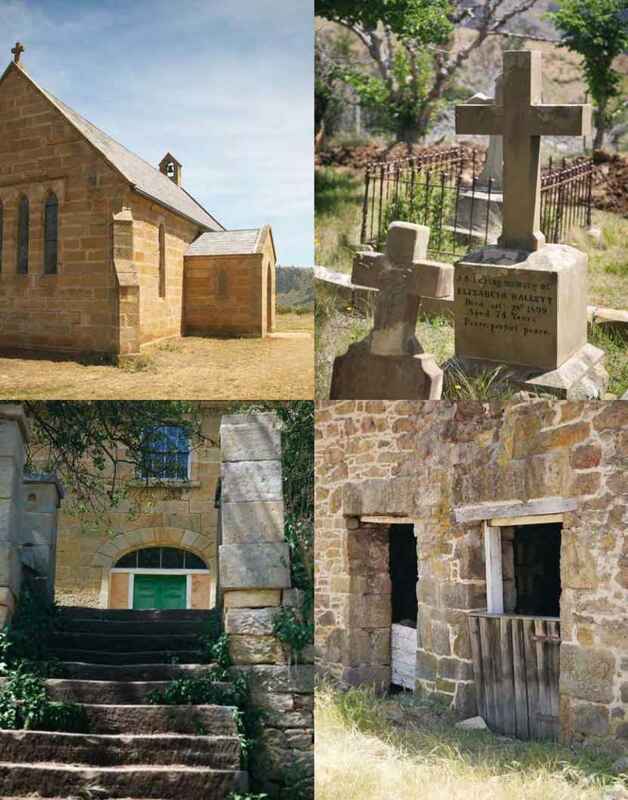 The Anglican Church can't afford to maintain some of its highest-profile heritage churches in Tasmania, let alone little St James at Montacute, and the amount of money, and skills, needed to maintain cultural heritage throughout Tasmania is a significant challenge. It was difficult to account for his taste so far as it concerned the situation of his home. Here was a stately house hidden in the depths of a narrow valley, almost in the nature of a gulch, on the edge of a river subject to flooding, and with access presenting difficulties for the transport of the day ... 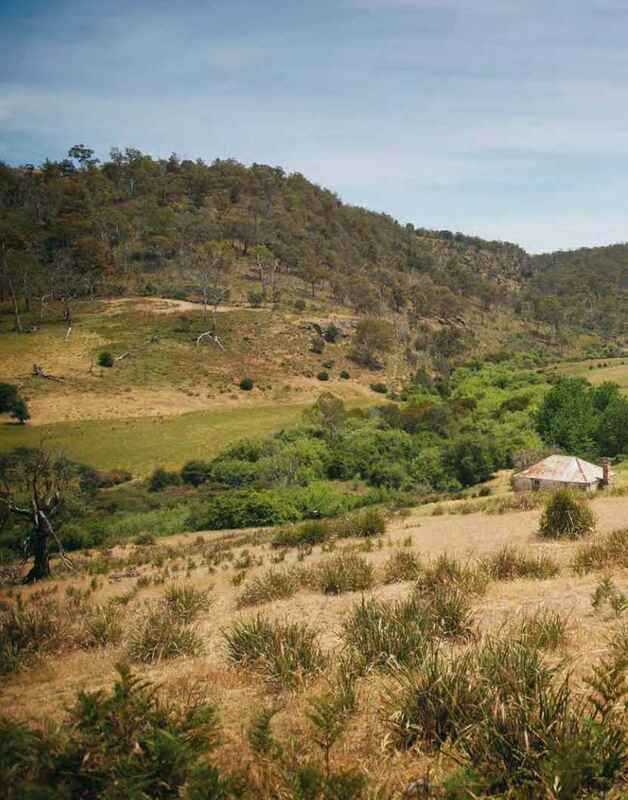 But if, like [Captain William] Langdon, he expected the fertile valley to bring further settlement and neighbours, he was disappointed, for Sherwood has remained isolated and concealed by the folded hills for nearly 120 years. 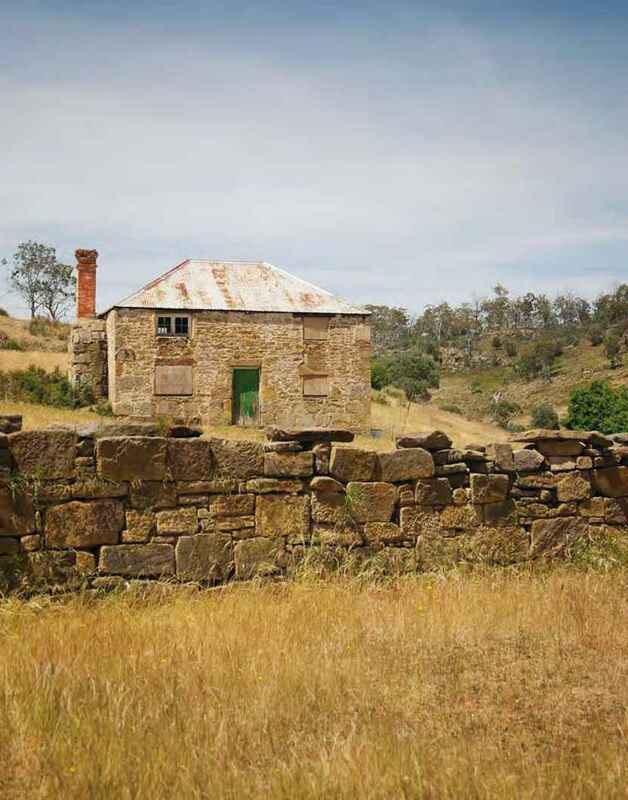 Sherwin was a merchant who moved to Van Diemen's Land in 1823 with his wife, daughter and three sons, and initially established a log house on the property that was destroyed by Aborigines in an arson attack. When he set about building a more substantial settlement, Sherwin did not scrimp on sandstone. The main house is a four-storey classic Georgian mansion (the cellar runs under the length of the home), with a kitchen, bakery and meat-house at the back. A coach-house and a barn are attached to the home, there were several stone cottages, and the ha-ha and dry-stone walls are considered excellent examples of their type. In 1843, notorious Tasmanian bushranger Martin Cash spied Sherwood from a hill with his telescope. He spent several days monitoring the comings and goings down below before making his move. Cash had already escaped twice from the supposedly escape-proof Port Arthur penal settlement, the second time with two bushmen, Kavanagh and Jones. Cash and Co., as they became known, targeted the well-to-do, and earned a reputation as 'the gentlemen bushrangers' because they didn't use unnecessary violence. Sherwin was in his sitting room, entertaining guests, when Cash struck one afternoon, taking fifteen servants hostage first and ordering them onto the sitting-room floor. So another gave me to understand by signals that we could find some grog in the cellar, upon which I ordered a bucket of wine to be brought, and gave a cup full to each, assuring them that they should have no more in case they might get elevated, and that by doing so, we might be obliged to shoot some of them to keep the remainder in order. Mr Sherwin now requested me in a kind of whine not to give the men any more drink; I observed that when he was master of the premises, he might act as he pleased, but while I claimed the sovereignty, I would not be dictated to. Cash seized some of the guns kept in the household, and then turned to the possessions of Sherwin and his guests, who included a founding member of the Hobart Quaker community Henry Propsting. 'Mr Propsting gave up some money, protesting on his honour that he had no more in his possession, but this, as we learned subsequently, was untrue, he having concealed his watch and 70 guineas in his boots; on being appraised of this circumstance through the medium of the Press, we solemnly resolved to trust no more Quakers in future,' Cash wrote. 'We collected a very respectable swag, however, of both money and property.' Legend has it that Cash buried a bottle of gold sovereigns on Sherwood Hill as he left, but despite the very best of efforts, they have never been found. Later that year, Cash was sentenced to hang for the murder of one of his pursuers, but at the eleventh hour was sentenced to transportation for life at Norfolk Island, later returning to Tasmania a free man. 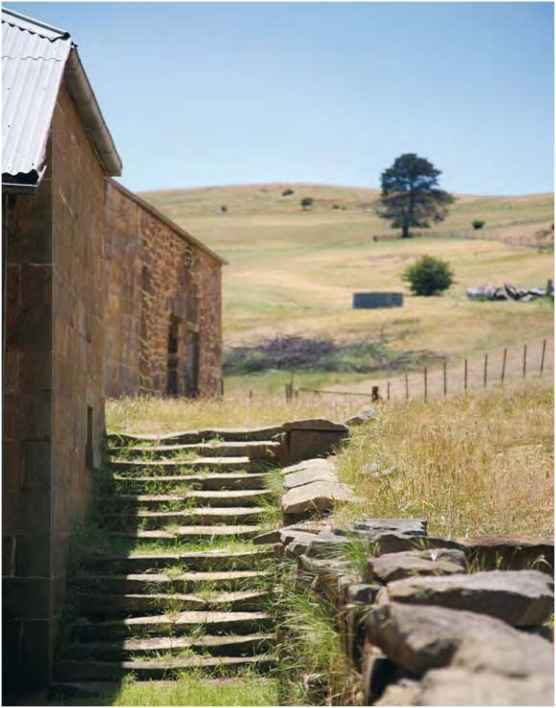 After a successful career in trade in Launceston, Sherwin's son Isaac retired to Sherwood in 1845 and made his mark by installing an irrigation system that is still regarded as an engineering marvel. A father-and-son team were tasked with excavating a tunnel through a sandstone hill above the River Clyde in order to transfer water into a channel system to irrigate the surrounding land. With only a pick and a shovel, they started at opposite ends, and when the two halves of the 150-metre long, one-metre deep tunnel met up in the middle, they matched almost perfectly. Isaac Sherwin was instrumental in lobbying the government of the day to store winter water in nearby Lake Sorrell and Lake Crescent to release into the River Clyde in summer and irrigate the surrounding crops. The Clyde River Trust, formed in 1857, still operates today, but a summer flow from the lakes is increasingly difficult to obtain. The Halletts acquired Sherwood in 1921. 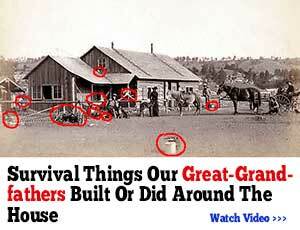 The house hasn't been properly lived in since the 1950s, save for some rabbit trappers and farm-hands. In the 1970s the Sandy Bay Scouts made the restoration of Sherwood one of their projects, and they visited about thirty weekends a year. Since the scouts left, the Halletts have kept Sherwood in good repair and they may one day resurrect the property's famous roast ox nights at the homestead on the first Saturday of spring. When Llanberis is done and St James spruced up a little more, their attention might turn to bringing Sherwood back to life as a home.